As a roofing contractor, a little knowledge goes a long way in helping your clients build confidence in their roof replacement decision. Whether you’re looking for ways to educate your clients or to save some money with DIY roof maintenance, we’ll give you a hand on the knowledge side. When we purchased our brand new home recently, the shingles came with a lifetime guarantee. That’s all well and good, but we’ll need to do some roof maintenance to keep it looking its best. As you walk around your house and on the roof, you’re looking for missing or loose shingles/panels and flashing along with any damage to seals around roof vents. 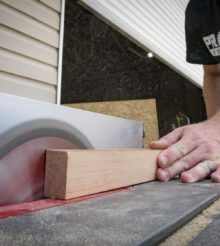 Those are all areas that can introduce moisture into the wood that should be covered, so you’ll want to have a professional fix them right away. Leaves, moss, twigs, and other debris collects in your gutters as the year progresses. When you do your spring and fall DIY roof inspections, check the gutters and downspouts as part of your roof maintenance plan. As they build up debris, they’ll clog and let water back up to the edge of your roof where it’s more likely it can find a way in to start attacking the wood. You can get rid of loose debris easily with a blower, though you’ll want to grab a pair of gloves to dig out any major build up. You can still use your pressure washer to spray the solution on your roof. Use your widest nozzle and lowest pressure – you’re applying a solution, not pressure cleaning. There are even some low-pressure attachments specifically designed for roof cleaning if you look around. Just note that most pressure washers warn against using bleach in the system, so stick with the dish soap or vinegar methods if that’s the way to want to go. Even if your spring/fall DIY inspections pass with flying colors, plan on calling a professional to come in for an inspection as part of your roof maintenance plan. How often depends on what climate you live in, but every 3 – 5 years is a good rule of thumb. Climates that get more rain and/or snow will want to be closer to the 3-year side, while those in the drier southwest can go longer. Most roof covers have an estimated life. Shingles used to be 20-year or 30-year, but now lifetime ratings are available. But just how long is a lifetime? Is it possible to need a roof replacement earlier? If your roof is sagging, that’s something you need to address immediately. Also, if you discover missing shingles or roof damage, you’ll want to have a professional come out and see if it just need a quick fix or if there’s deeper damage. Mot likely, there’s going to be adhesive involved in replacing or fixing your roof. You need the temperatures to be warm enough for it to work and set before cold weather sets in. Feel free to ask your contractor about the exact timing since different products will have different installation temperature ratings. Generally, early spring and late fall are good times for a roof installation. That gets you out of the freezing temperatures and away from the big rains. Should I Do a Roof Replacement If I’m Selling? Yes! Your home is going to have a professional inspection before a lender will sign off on the loan for your potential buyer, and that’s going to include a roof inspection. Both you and your buyer will know if it needs to be replaced. If the buyer wants your home and it needs a roof replacement, you may have to settle for a lower price to close the deal. While replacing a roof averages around $7500, the National Association of Realtors says you’ll average a 109% cost recovery when you put the “For Sale” sign in your yard. Remodeling Ideas And Home Improvement Projects: What Pays Off? The easiest way to go is simply to replace the roof you have with the exact same materials. Switching can save you money in the long run, last longer, and/or give your home a completely new look. Here’s a breakdown of the most popular roofing materials. Need a Home Value Increase? Just Add Starbucks!